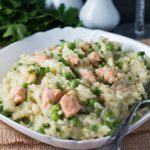 There's no tedious stirring with this easy Salmon and Pea Risotto - just throw it all together and simmer until creamy and delicious! 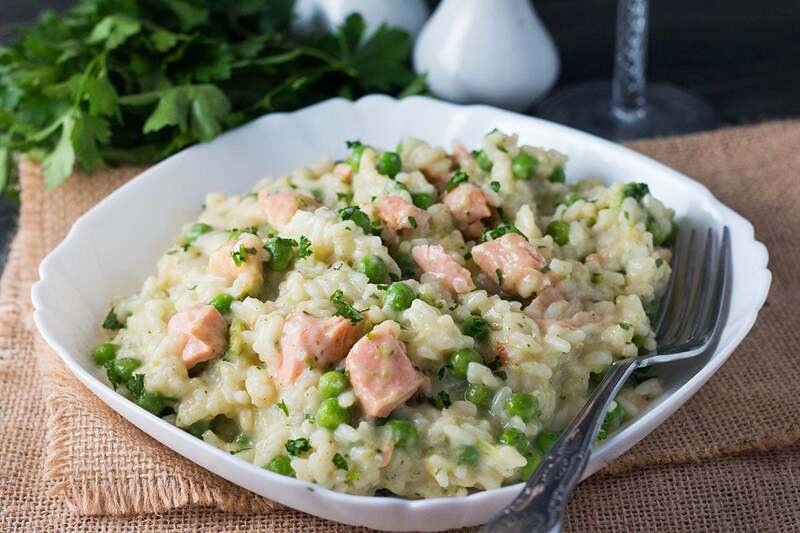 This recipe for Easy Salmon and Pea Risotto requires no constant stirring. Poached Salmon makes a delicious addition to this quick one-pot dish with frozen peas and fresh herbs. It’s ready in 30 minutes. I love risotto, but God, do I hate making it! All the stirring and ladling stock into the pan is just plain exhausting! 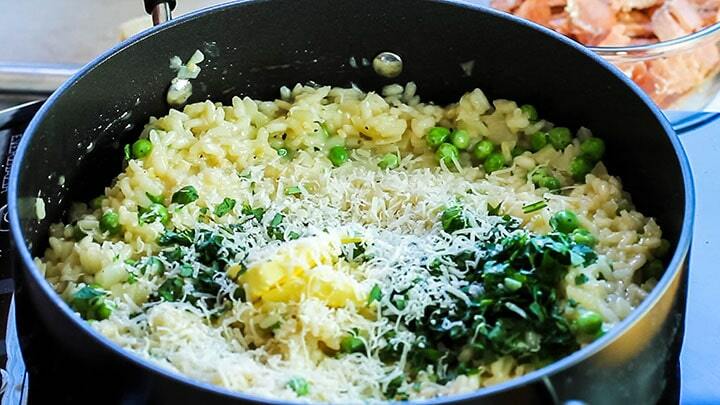 But I’m going to let you in on a little secret – Despite what every Italian cook will tell you, you don’t need to chain yourself to the stove to make a beautiful risotto. 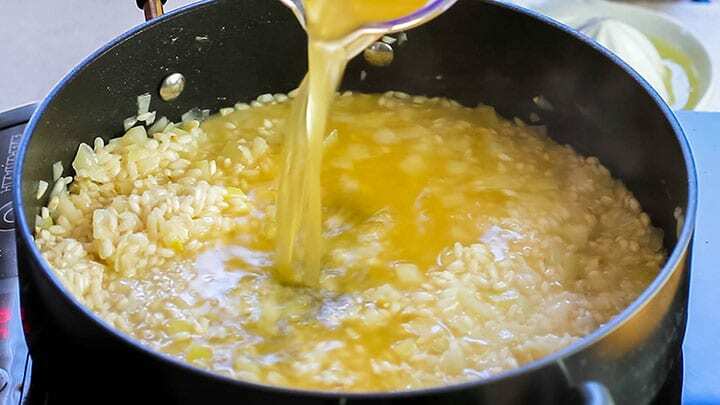 This foolproof method for making risotto is so much easier and although a trained chef may see a difference to the classic version, nobody I have served this to has. If anything, anyone who’s tasted this amazing recipe has always asked for the recipe! The creamy lemon and garlic-scented risotto is complemented perfectly by the poached salmon and peas. There’s no constant stirring involved making this a very quick and easy recipe. It’s a filling and affordable dish that you could have any night of the week! 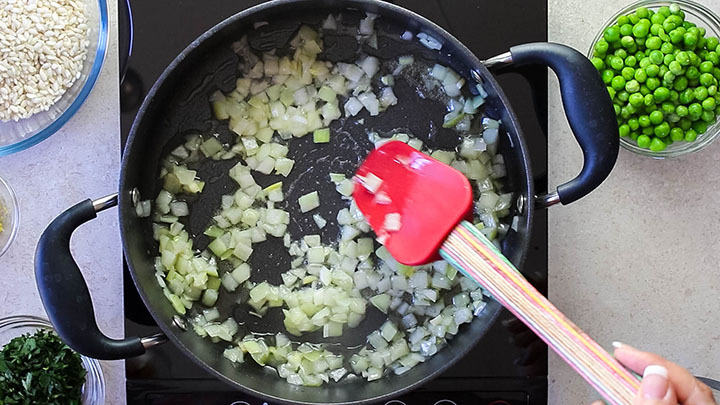 In a large pan, saute onions in 2 tablespoons of butter until they are cooked and soft but not browned. Add all the rice and stir it around with the other ingredients to toast the grains thoroughly without browning. Raise the heat to high, add the wine to the rice, onions and garlic. Allow the wine to reduce it until nearly all of the liquid is absorbed into the rice. Add the the stock. Add lemon zest, lemon juice, and seasoning. Meanwhile, poach the salmon in some stock for about five minutes. 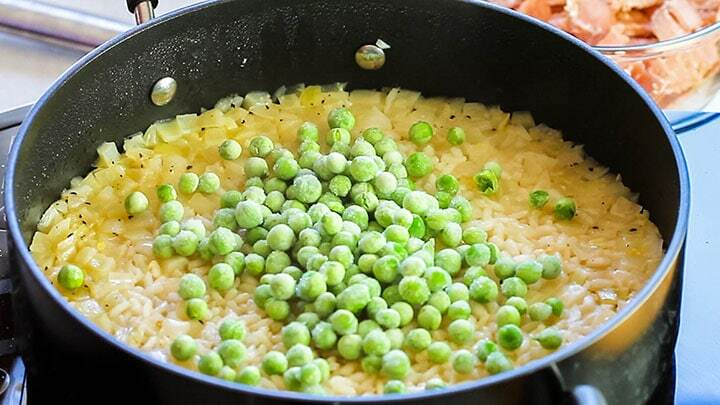 Once the rice is just under cooked, add the frozen peas. Cook until the rice is tender. Add the chopped parsley and the butter. Followed by the grated Parmesan cheese. 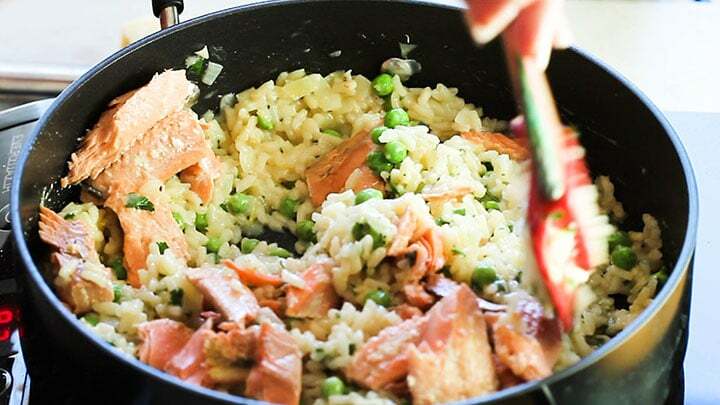 Break up the salmon and add it to the rice. Taste and season before serving. When poaching the salmon, poach it until it’s just under cooked. It will finish cooking when it’s added to the risotto. Be careful not to overcook the rice or it will be soft and unpleasant to eat. 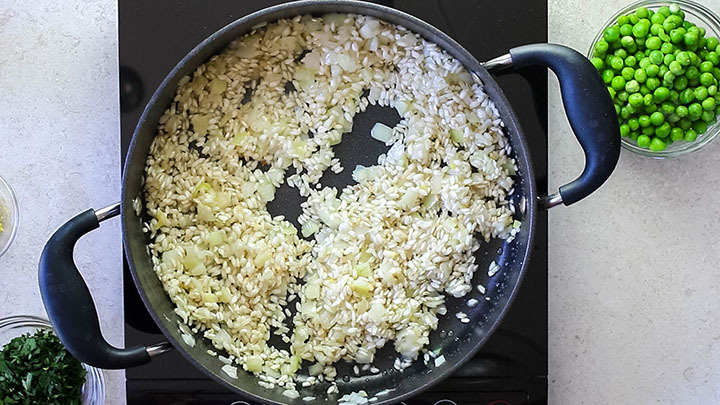 Always use Arborio rice – It has a higher starch content which is what gives it the creamy consistency. Don’t be afraid of frozen salmon – If it’s been vacuum packed and the label says that it was flash-frozen immediately after harvest, it may taste fresher than the fish behind the counter. Swap out the salmon for shrimp and you’ll have a whole new dish. If you don’t like using Parmesan cheese with fish, try adding a couple of tablespoons of Mascarpone instead. Asparagus makes for a great substitution if you don’t like peas. No wine in the house? You can use dry white vermouth instead. Can I freeze this recipe? I would avoid freezing risotto. Its not a dish that thaws and re-heats well. How do you store leftovers? Just store it in an airtight container and it will be good for up to three days. 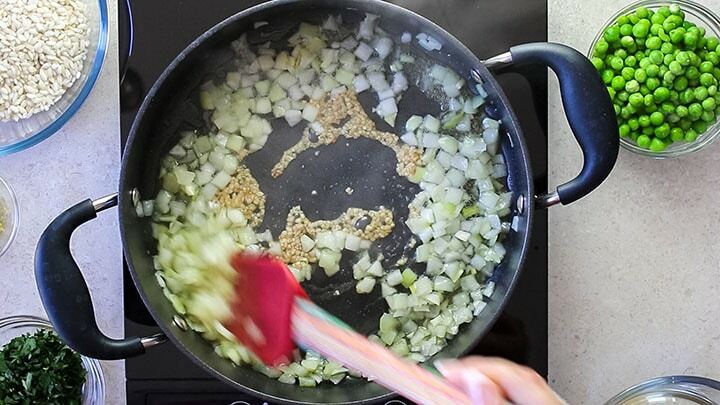 In a large pan, saute the onions 2 tablespoons of olive until they are cooked and soft but not browned. Stir in the stock, lemon zest, and lemon juice. reduce the heat, stir and leave to cook covered 15-18 until the rice is just undercooked (Checking after about 15 minutes to make sure no additional stock is needed. 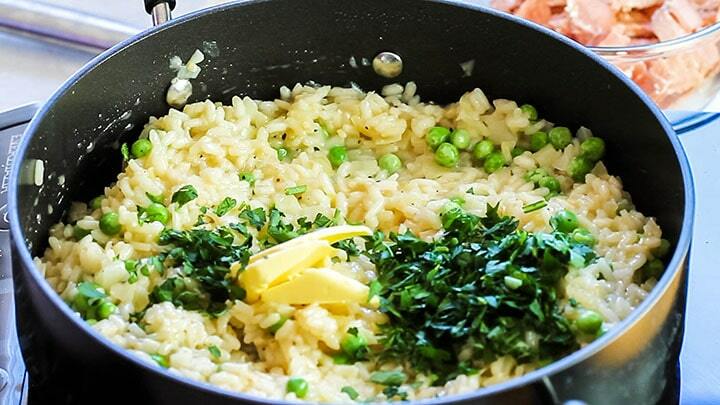 If the risotto looks dry, add some of the remaining stock). 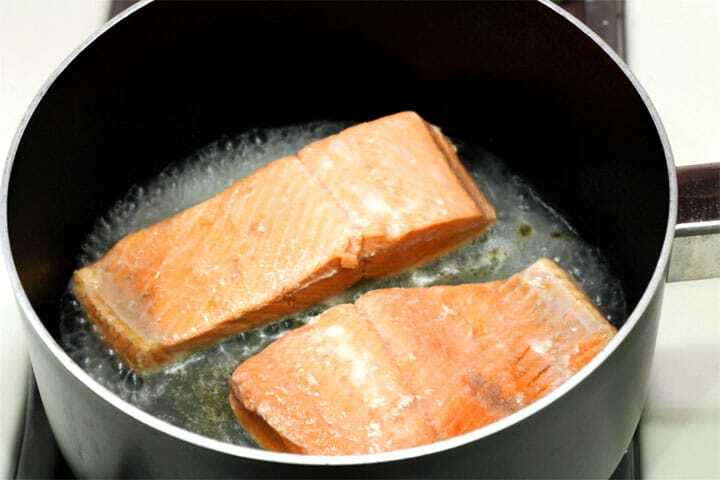 While the rice cooks, Bring the stock for the salmon to a boil; Add the salmon fillets, reduce to a simmer, cover, and cook 5 minutes (until just underdone. It will finish cooking in the risotto). Once done, break up the salmon to your liking. When the rice is just undercooked, add the peas, stir and cook until the rice is done. Add the chopped parsley, the butter, and grated Parmesan cheese. Mix together. Add the salmon and season to taste before serving. When poaching the salmon, poach it until it's just under-cooked. It will finish cooking when it's added to the risotto. Hi Amy, Yes, it can just make sure you don’t refreeze salmon that was already cooked, fresh salmon is good to freeze! 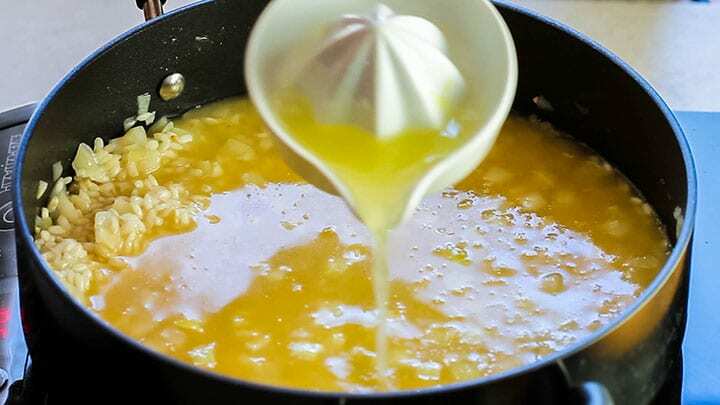 I love risotto, but hate the constant stirring, this worked perfectly – aside from making a much smaller portion but forgetting to scale down the lemon. I microwaved the salmon, making even less work. I can see me making lots more risotto in the future. Thank you, Donna. It was lovely to hear your feedback glad it worked well for you! Hi, Donna Thank you for your feedback and I’m glad it worked out well for you! Great recipe! I made this with the belly trim that I marinated overnight in lemon juice, olive oil, fresh basil and parsley, then poached in the marinade. I used the skin and leftover marinade to form the stock. I didn’t need the additional butter at the finishing step because of the super fatty fish. I did squeeze some fresh lemon juice at the end though. Turned out very rich and creamy but the fresh herbs and lemon balance it out nicely. Wow, Heather, that sounds great! Thanks for the info! Glad you enjoyed it! Literally, one of the best dishes I have ever eaten, let alone actually cooked myself! Almost forgot I was eating at home and not in a restaurant! Thanks! 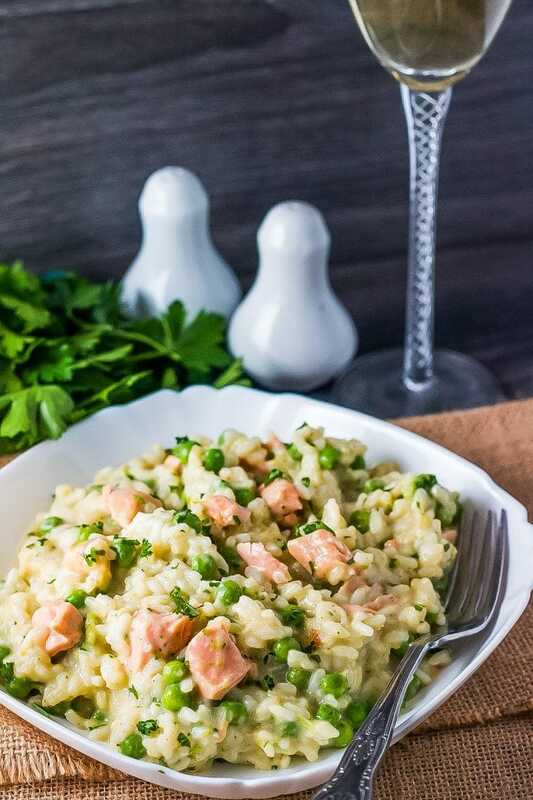 This is a perfect risotto! 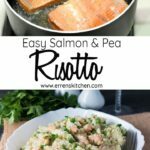 I usually do pea risotto with pork but this is an upgraded version ! Thank you so much !